The hate campaign against MLA PC George is continuing vigorously on the social media considering his derogatory remarks on the attacked nun. After the ‘Remove PC George’ hashtag, the cello tape campaign is gaining wide support. The new campaign is called "Vayamoodeda PC" or "shut your mouth PC". The new campaign involves buying a cello tape and sending it to PC George to express protest. Now, actress Parvathy has offered her support for the campaign. She lashed out at PC on her Twitter account for his abusive language. She also saluted the protest of the nuns which is aimed at ensuring justice to the nun who survived the abuse. 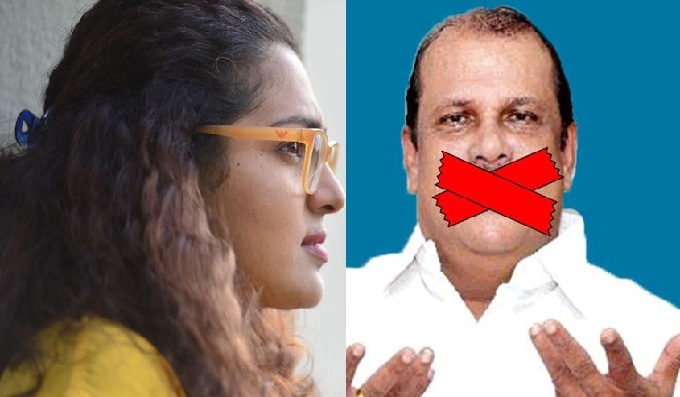 “Enough of this man’s DISGUSTING WORD VOMIT”, wrote Parvathy. Several people including Bollywood celebs have come forward against the remarks of PC George. Bollywood star Raveena Tandon said that these attempts are aimed at frightening the victim. She demanded that the Women’s Commission should act in the issue. The Women’s Commission has decided to move legally against PC George. They have sent summons to PC George demanding him to appear before the court on September 20. The MLA had made abusive comments about the nun in Kottayam.